Home › Google | Internet | SEO | Yelp › Has There Been an Update to Google Local Map Rankings? In late January 2016 we started to notice a disruption to Google’s local map rankings. While we have several theories about why this disruption may have occurred, we do not yet have all of the details. If your business has noticed a drop in Google local map or organic search rankings in January 2016, we can help! Please contact us at jwojdylo@gmail.com for more information. Here is the issue we see. Currently, it seems as though there is no relation between organic Google search results and local map Google search results. Ever since Google has been working on perfecting the Google Pigeon algorithm, organic search rankings have made a significant impact on what appears in Google’s local map results. 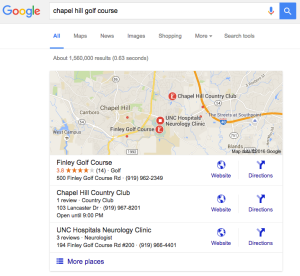 However, if you notice in the image below, with a Neurology Clinic ranking as #3 in a Google search for golf courses in Chapel Hill, North Carolina, the connection with organic search seems to be lost. Another issue we have noticed with searches related to professional businesses is that fewer bona fide websites have been appearing in search and more business-rating websites have been popping up. 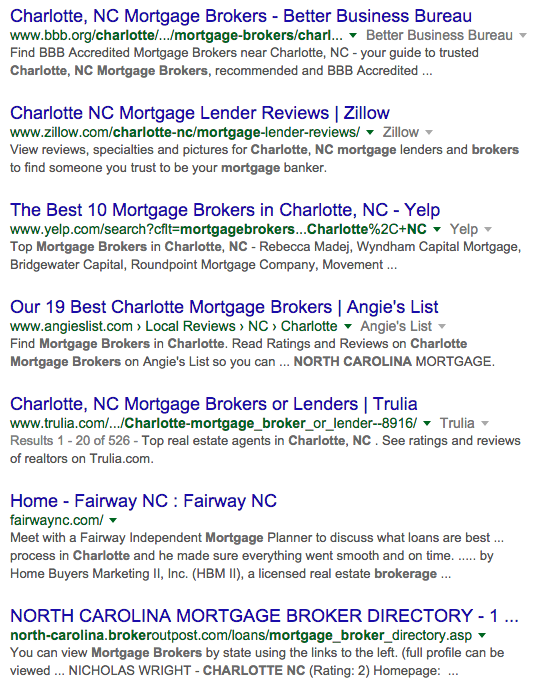 In the image below I searched for “Charlotte NC Mortgage Broker” and these are the top organic search results that appeared. 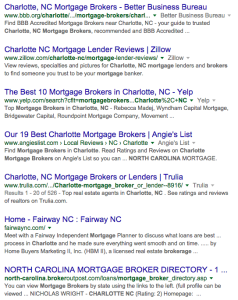 As you can see, the page is full of business-rating sites, such as Zillow, Yelp, Trulia, Yellow Pages and Angie’s List, instead of websites for actual mortgage brokers in Charlotte. Combined, these changes to Google search could be seriously affecting certain businesses that rely on Google search for traffic. It is also possible, as I just experienced with several of my test searches for this article, that you are not seeing map results at all. This is a clear indication that something is wrong with Google search results. Google is consistently testing their algorithm based on how users react to the search results that pop up. This is because Google wants to ensure that users have the best experience possible when using their search engine. Occasionally, we have seen Google move poorer sites to the top of their search ranking to validate their algorithm with low click-through rates (CTR) and bounce rates of the poorer sites. In every case, these sites are flushed from Google search rankings. 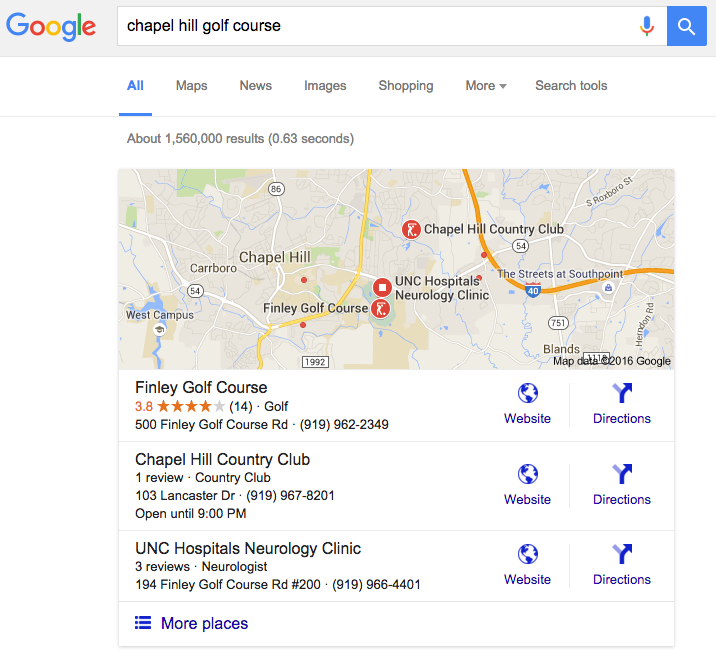 There are so many factors in Google’s algorithm, both for organic and local map search. It is possible that something has gone wrong with the algorithm or an increased importance has been placed on a single factor within the algorithm that has caused this change. The way that Google registers businesses is very complicated. Currently Google uses My Business to register businesses online. In the past, there have been other tools to register businesses, such as Google Plus Local Pages, Google Places, Google Business Pages. If Google is trying to combine all of their past business registration tools with Google My Business, this could be causing confusion in the local search results as they iron out the wrinkles. It is possible that something else entirely is going on , but we can not be sure yet. It is our professional opinion that the current local map rankings will not last. However, if your business does rely on local map search, you could be seeing a huge drop in traffic right now and there is a way to combat it. While more difficult, ranking in organic Google search will always be the best way to gain internet and legitimate traffic to your business. To rank in organic search, you must have a strong internet presence and continuous optimization of the information on your site. If you have both of these things, it will not matter if local map results ever fluctuate, because you will continue to rank in organic search. It is also possible, that if and when this issue is resolved, the business rankings will not be the same as they were before. This may be an issue for you if you did rank high in Google search before this disruption. If your business is looking to increase its internet presence and/or optimize its current website content, please contact us at jwojdylo@gmail.com for more information. If we come across any more information about the local map disruption, we will let you know. Stay tuned for updates! Is There a Google Algorithm Update in January 2016? | LinkedIn Target Prospect Sales Leads 2016 – Is it Worth It?